In the world of sports sedans, the BMW M5 has always been the benchmark, from the decades-old E28 generation to the fans’ darling E60 and its V10 naturally aspirated engine. Its bloodline now stretches across six generations with the arrival of this latest F90 model which brings a novelty to the M brand, the first ever M5 equipped with the long overdue all-wheel drive system. If you are interested in the BMW M5 at Pfaff BMW, we encourage you to continue reading this article. The new BMW M5 takes driving dynamics into a new dimension. Making its debut in the sixth generation of the high-performance sedan is the new M-specific all-wheel-drive system M xDrive. Not only does this drive system enable the M5 to reach new heights of dynamic performance, it means that it excels in terms of everyday practicality and delivers supreme poise in all driving conditions as well. Thanks to M xDrive, the new BMW M5 can be piloted with the familiar blend of sportiness and unerring accuracy both on the race track and out on the open road, while also delighting drivers with its significantly enhanced directional stability and controllability right up to the limits of performance when driving in adverse conditions such as in the wet or snow. 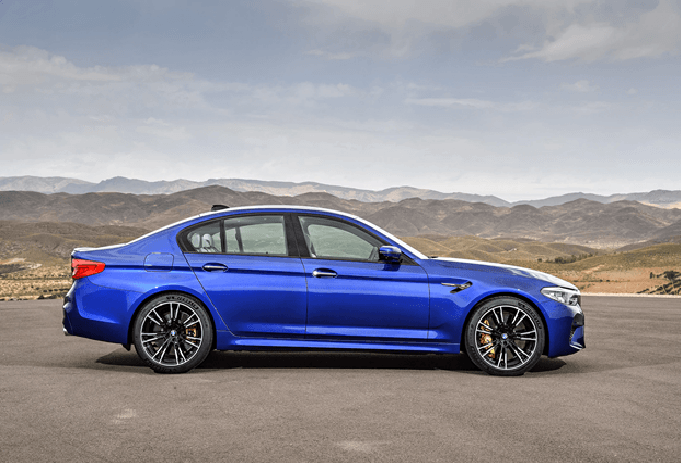 The new BMW M5 is fitted as standard with M compound brakes, which are lighter than conventional grey cast iron items, lowering the car’s weight while having the speed-shedding power to befit the car’s dynamic potency. The optional M carbon ceramic brakes, which can be identified by gold-painted calipers and shave another 23 kilograms off the M5’s weight, can withstand even greater punishment. Hard at work under the bonnet of the new BMW M5 is the latest and most advanced version of the 4.4-litre V8 engine featuring M TwinPower Turbo technology. A 600 hp output and peak torque of 750 Nm promise supreme propulsive power and formidable performance. The twin turbo V8 unit propels the new M5 from 0 to 100 km/h in a mere 3.4 seconds. The new eight-speed M Steptronic transmission with Drivelogic teams up with the M xDrive system to transfer the high-revving engines turbocharged might to the road in all driving conditions. The BMW M5 can be found at our Pfaff BMW dealership in Mississauga. This premium quality sports car is a beast and will be sure to plaster a smile on your face everytime you get behind the wheel. For more information about the BMW M5 at Pfaff BMW, please feel free to continue browsing through our website. Click here to find our contact information, schedule a test drive, or to fill out our contact form.